My tablescape was inspired by two things, the teal spider runner and to help bring attention to Food Allergies, teal pumpkins. This year, teal colored pumpkins, are being used for a promotion by the Food Allergy Network, highlighting the prevalence of food allergies. Of which I have a few. I keep my epi-pens handy. If you click on the photo, they will enlarge for a better view. Salad plates from Pier 1. Each plate has a different design and I liked how they have a touch of teal. The skull I purchased last Easter from Home Goods. They were available in several colors and I planned ahead. I wanted to dress her up a bit so I added the spider web bow. 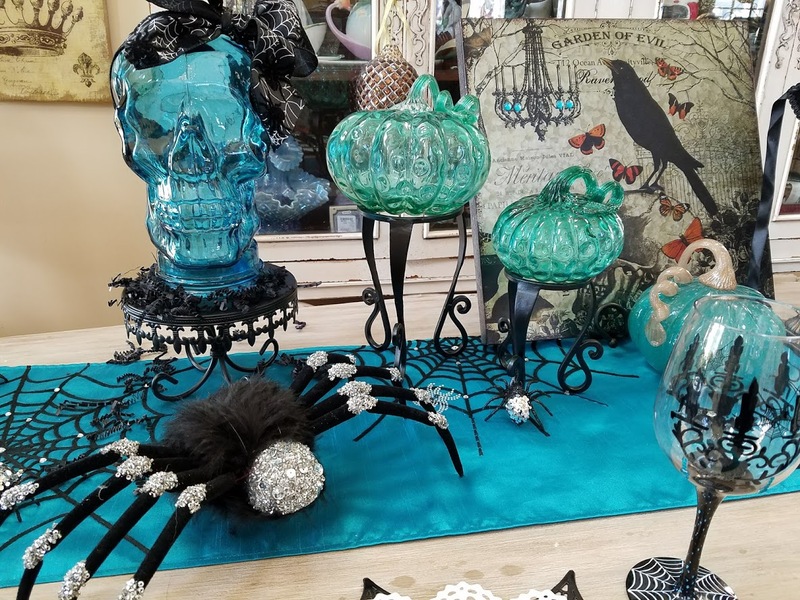 I really like this piece of artwork, with the skulls, spiders, and especially the chandelier. The only thing is there was no teal so I added some Bling, the teal rhinestones. 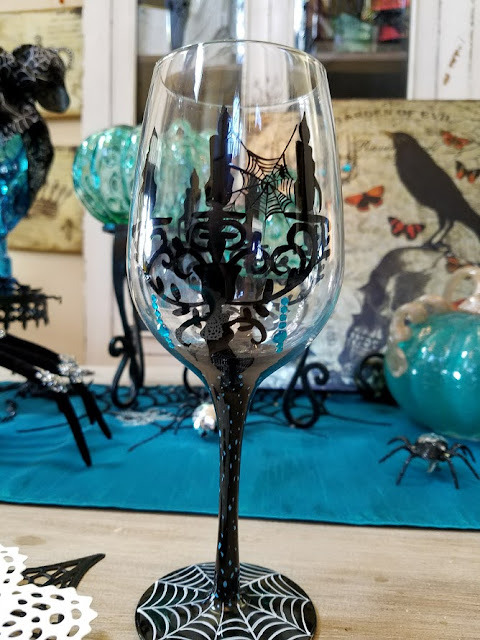 The chandelier design is also on the goblets, there are also some teal beads on the goblets, so to tie them all together again, I added the teal rhinestones on this piece. 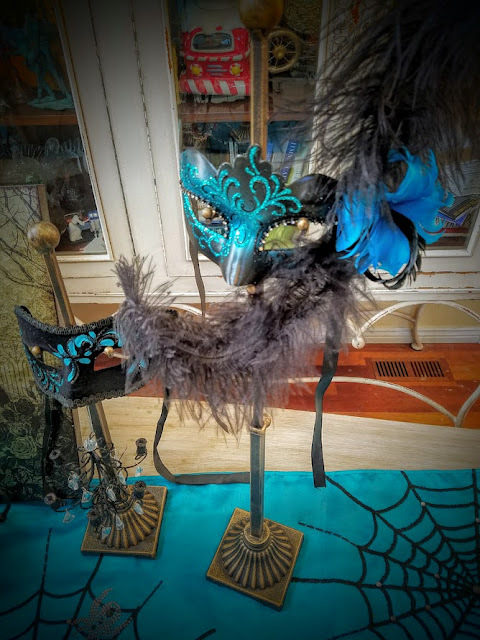 My mask on its own stand. I hung a little chandelier ornament on the stand. Closeup detail of the goblet. I bought mine last year at Pier 1. I think there are some similar with the current Halloween line. 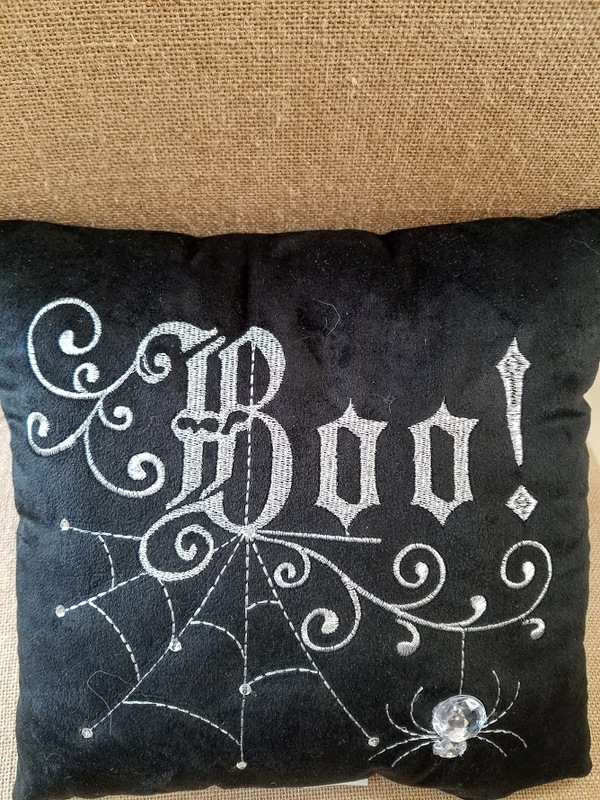 This is the pillow I will be placing on each chair. I am going to tie a black organdy sash on the back with some teal ribbon as well. Please feel free to leave a comment below. They make my day. Thank you for taking the time to check out this Blog post. 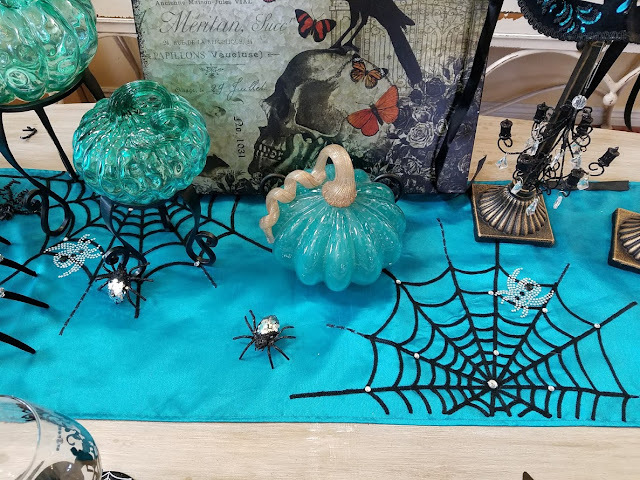 I love teal and turquoise - your table is right up my alley! I also have food allergies so I feel for you. 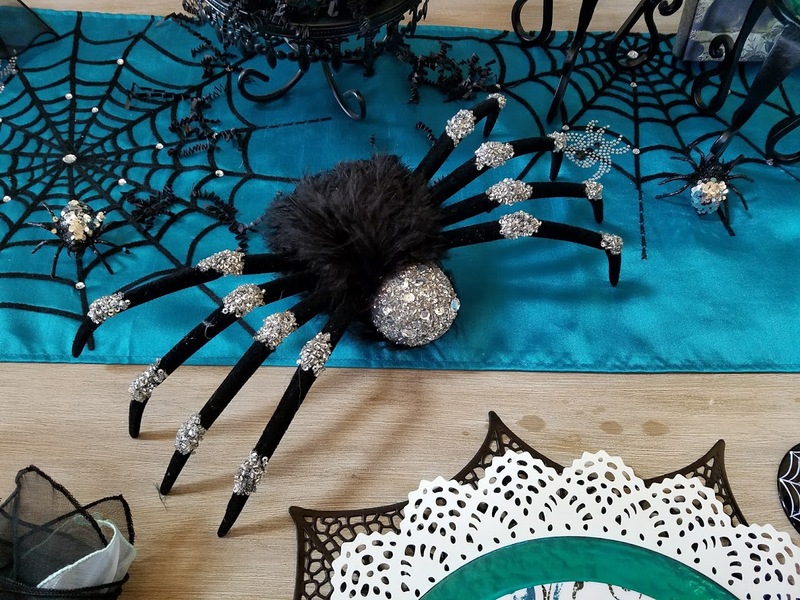 Lovely Halloween table. 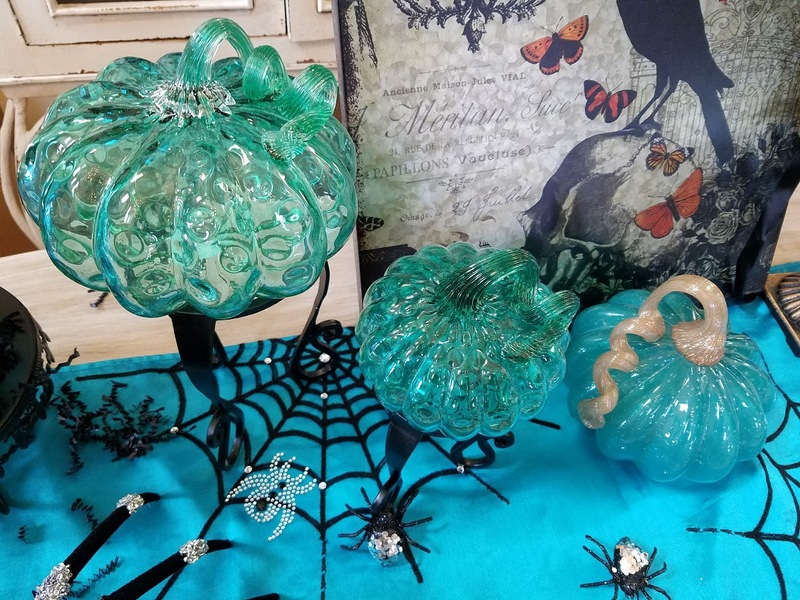 I just recently heard about the teal pumpkins for Halloween and placing one by your door if you had allergy free treats, such a wonderful campaign! Your teal and black table is so cool Valerie, I've been looking for teal pumpkins for the beach house and love love your glass ones. The bow on your skellie really cracked me up! 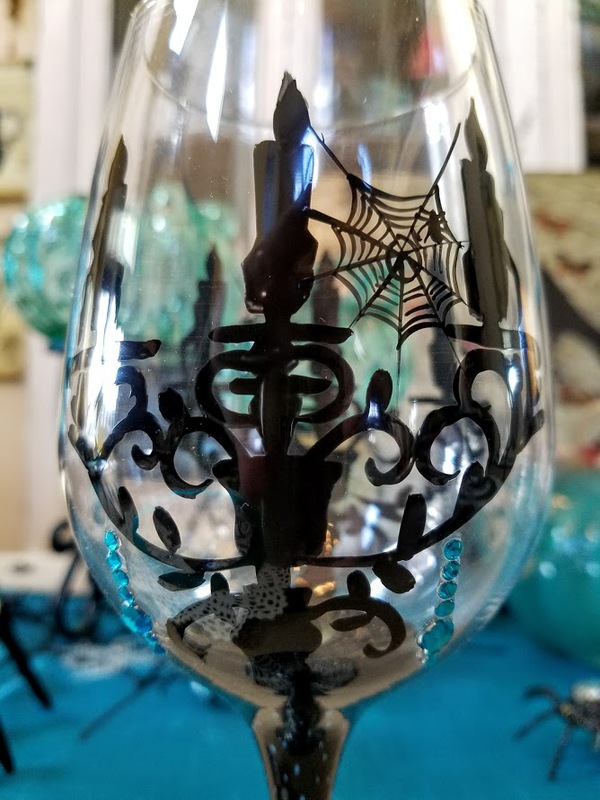 So cute, and your Pier 1 plates are just perfect! 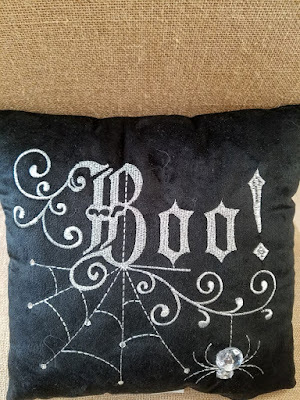 I have that little boo pillow too, love it! 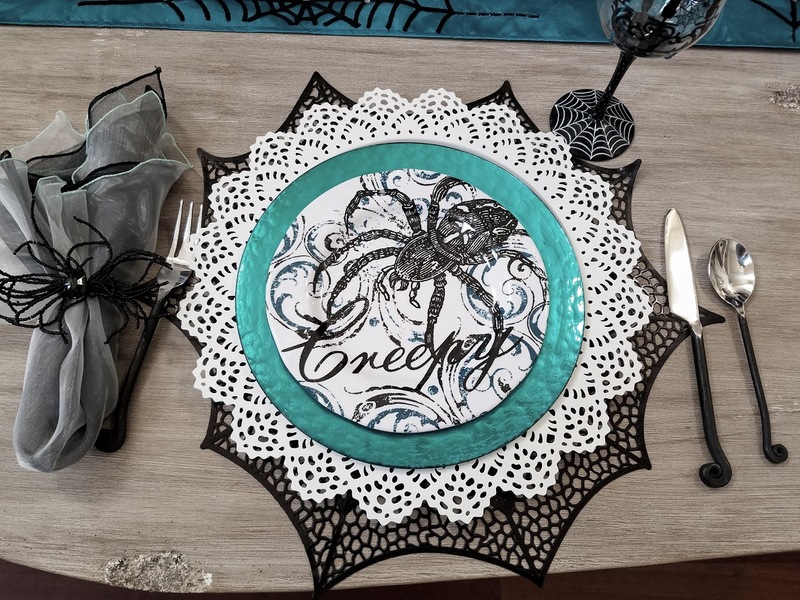 Gorgeous tablescape Valerie. No one said it has to be orange and black. 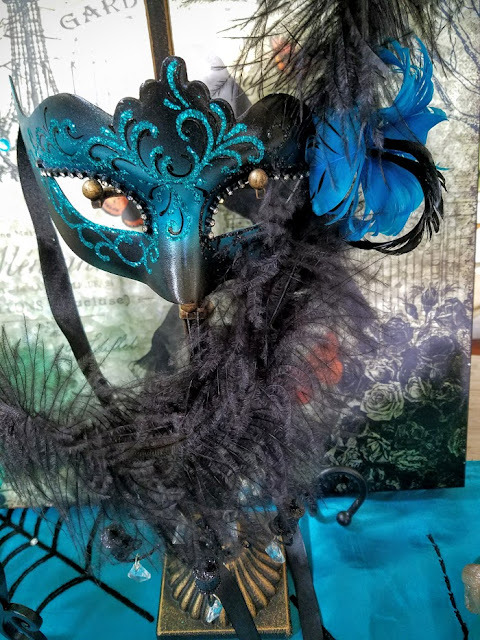 The teal accessories are lovely. The pillows are a nice addition. Love how you dressed the skull. 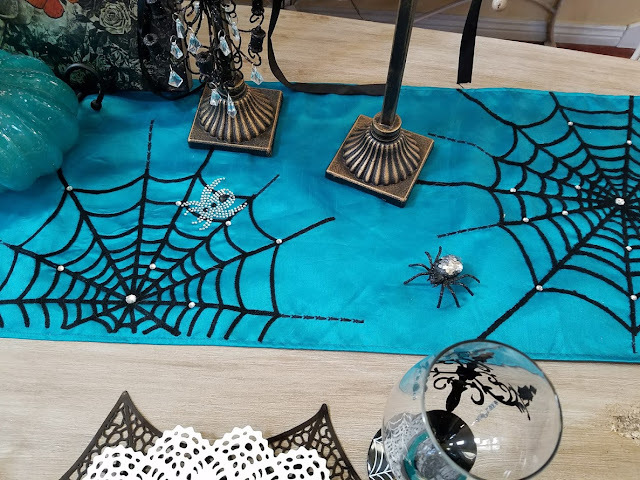 A lovely table for Halloween to enjoy by all. Valerie love the color in this tablescape I wish my pier one had plates like these. Valerie, luv, luv, luv the teal; thanks for your efforts in highlighting food allergies. I have neighbors who put a teal pumpkin out on Halloween, indicating their treats are allergen-free! 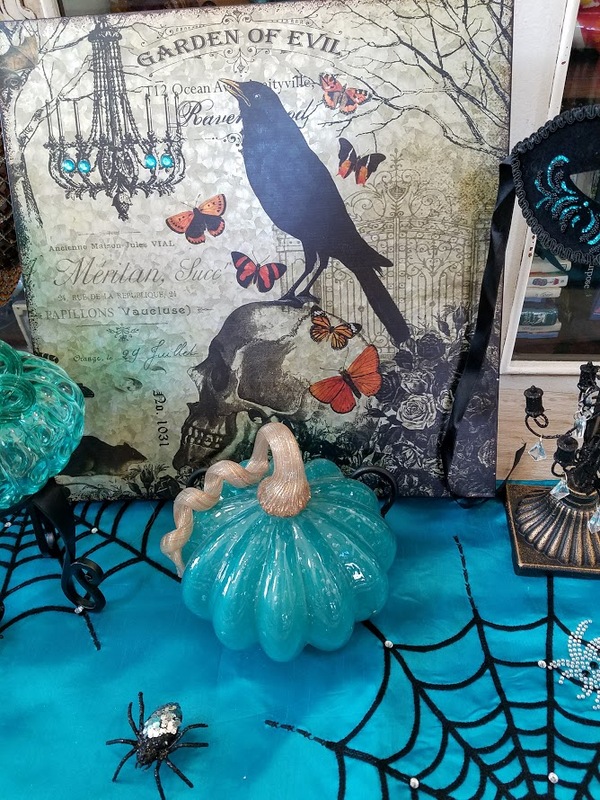 I love the color teal and your cool teal glass pumpkins. Thanks for sharing about the Food Allergy Network highlighting the prevalence of food allergies. Your creative table is striking. 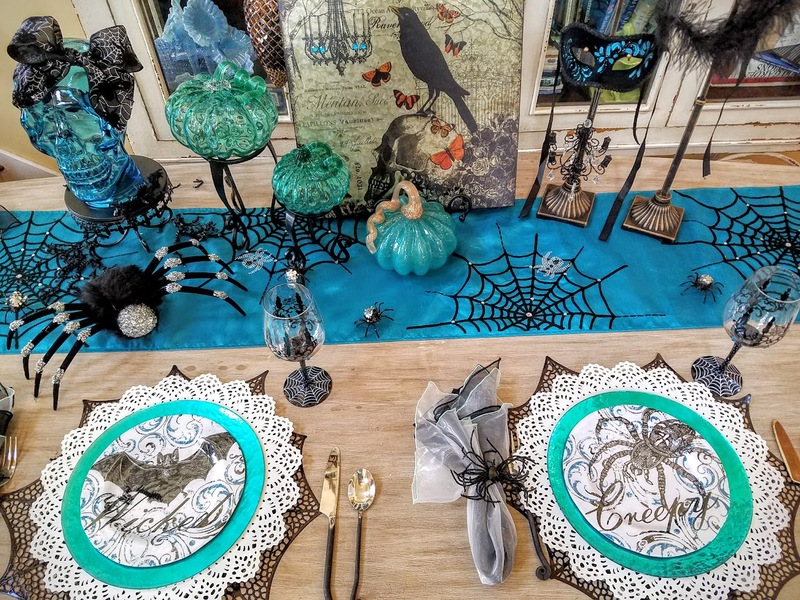 What a fabulous tablescape and in such inspired colors! 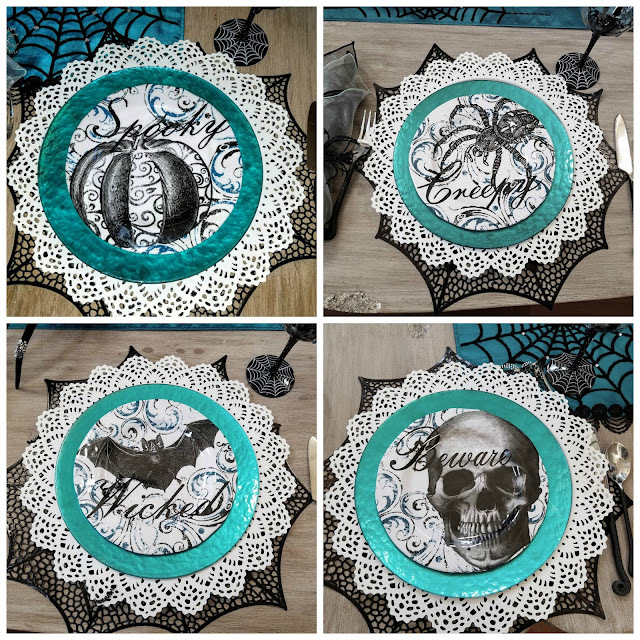 I love everything that you've used here (I have very similar plates that I'll be putting to use shortly). 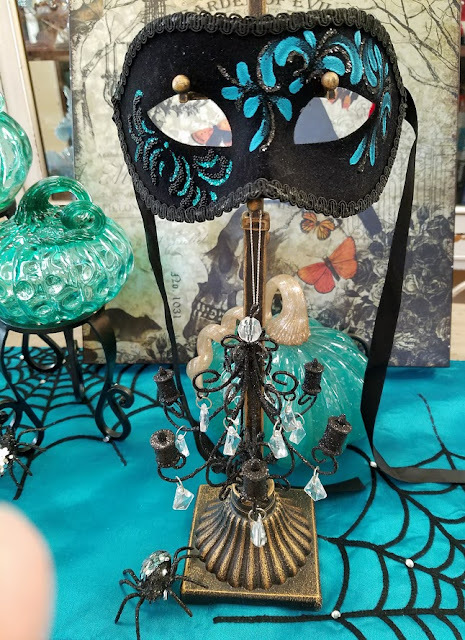 I have been eyeballing those chandelier glasses at Pier One, but was sort of put off by the little blue additions. You have really made them work here. Very nice! I recently found out the meaning of the teal pumpkins and it is a great idea. This color combination is such a beautiful alternative to the traditional color palette. The mask on the stand is very pretty. 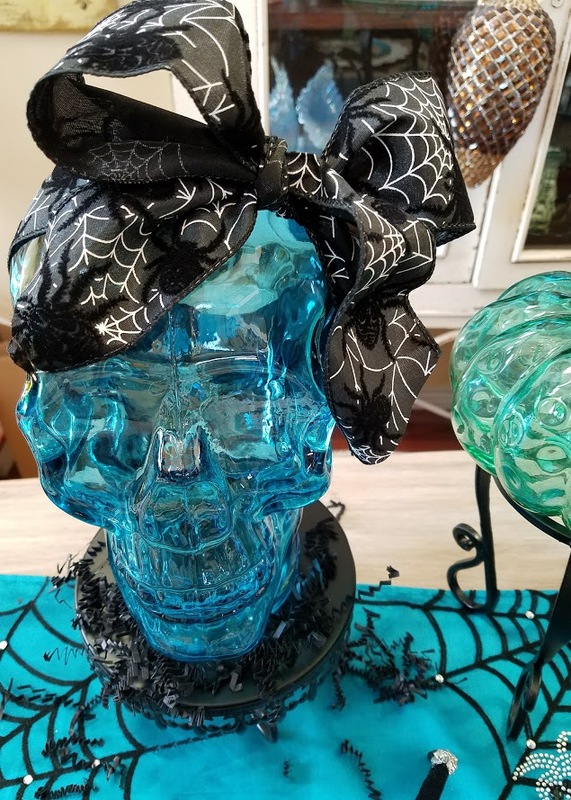 Hats off to you for another beautiful tablescape!